1.1. RetargetApp guarantees that personal and business data obtained from the user (also referred to as data subject) will never be disclosed to any third party except for our trusted data processors listed in 6.3. 1.2. RetargetApp reserves the right to use the stats obtained from campaigns created by RetargetApp. This refers to, but isn’t limited to collecting, analyzing, storing, aggregating and publishing campaign data in a form of research and case studies. 2.2. RetargetApp reserves the right to store the above-mentioned data in its internal database as well as provide it to the 3rd party data processors listed in 6.3. 2.3. The access to all the assets listed in 2.1 is to be provided by the data subject during the application onboarding process. 2.4. Personal data is stored by RetargetApp during the whole period of the app usage and up to 1 year after the user chose to stop using RetargetApp services unless procedures listed in 4.2 and 6.5 are initiated. 2.5 If the user chooses to transfer any personal data to RetargetApp, he/she guarantees that a proper consent for data collection, storage and transfer has been obtained from the data subjects. 3.2. RetargetApp reserves the right to store the above-mentioned data in its internal database as well as provide it to the 3rd party data processors listed in 6.3. 3.3. RetargetApp will not take any responsibility for the problems with the service if access to at least one of the above-listed assets was revoked by the user who is currently running at least one campaign with RetargetApp without prior written notice to RetargetApp. 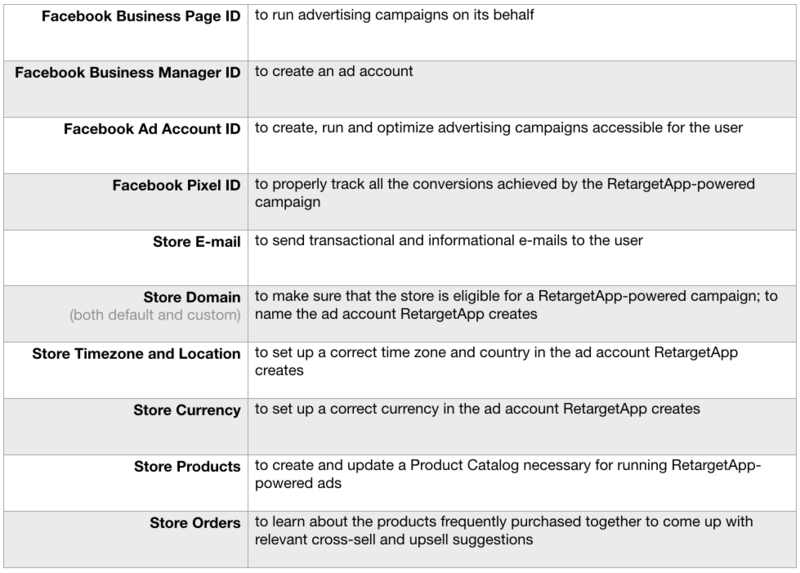 3.4. Business data is stored by RetargetApp during the whole period of the app usage and up to 1 year after the user chose to stop using RetargetApp services unless procedures listed in 5.2 and 7.5 are initiated. 4.1. RetargetApp may request payment data from the store owner to ensure the payment for RetargetApp services. 4.2. If requested by RetargetApp, payment data is collected, stored and processed by an external payment service provider, Stripe. 4.3. RetargetApp doesn’t store any of the payment data, nor it can view, edit or transfer payment data provided by the store owner. 4.4. The data subject has the right to remove the payment data at any time by contacting RetargetApp at help@retargetapp.com. RetargetApp will then send a request to Stripe, the payment processor, asking for the payment data to be removed. This will suggest an immediate termination of service RetargetApp provides until a new valid payment method is connected to RetargetApp. 5.1. The data subject allows RetargetApp to process all the necessary personal and business data before creating a RetargetApp account. 5.2. The data subject has the right to revoke the consent for data use at any time in RetargetApp Account Settings. This will suggest an immediate termination of service RetargetApp provides as the data is vital for RetargetApp operation for reasons provided in 2.1 and 3.1. 6.1. RetargetApp uses services of 3rd party data processors to make sure that the users are duly informed about all the aspects of the app operation. 6.2. RetargetApp has made sure that the 3rd party data processors it cooperates with take data security very seriously and are compliant with all major data protection regulations, including GDPR. 7.3. A digital copy of the personal data processed by RetargetApp and 3rd party data processors can be requested via e-mail help@retargetapp.com and shall be provided within 72 hours from the moment the request was received. 7.4. A request for correction of the personal data processed by RetargetApp and 3rd party data processors can be sent via e-mail help@retargetapp.com and shall be fulfilled within 72 hours from the moment the request was received. 7.5. A request for deletion of the personal data processed by RetargetApp and 3rd party data processors can be sent via e-mail help@retargetapp.com and shall be fulfilled within 72 hours from the moment the request was received. This will suggest an immediate termination of service RetargetApp provides as the data is vital for RetargetApp operation for reasons provided in 2.1 and 3.1. 8.2. Any data-related questions are to be sent to help@retargetapp.com.